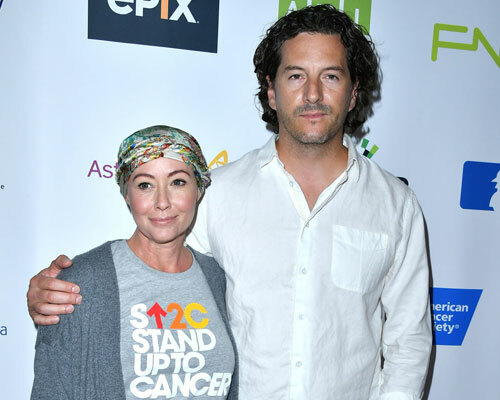 Shannen Doherty is truly a fighter! The 45-year-old actress has been stronger than you could imagine throughout her battle with cancer and it’s partially because of the love and support she has from her husband. Doherty has been battling cancer since March 2015 and her husband, Kurt Iswarienko, has been standing by her side every step of the way. The couple has been married for five years and, as Doherty has continued to fight and show signs of healing, she’s continued to lean on Iswarienko. In fact, the Charmed actress has been posting photos of her and her husband as a part of the #loveyourspousechallenge for days. She recently posted a picture that is SO full of love it made our hearts grow just reading it. On Saturday, which was day six of the challenge for her, Doherty shared a selfie with Iswarienko and the caption will make you cry tears of joy. "This is us now. Life has handed us an interesting card with cancer and although we would both prefer to not be faced with such a terrible disease, we must also search for the good," Doherty captioned the sweet selfie that also shows off her shaved head. "Am I blessed? Yes. Blessed for my friends that I have. Blessed that I have a fantastic mom and blessed that this man is in my life. Cancer gives a clarity that is unique. I've seen friends run, I've seen strangers step up, I've seen the unwavering still unwaver and I've seen @kurtiswarienko there for it all. That's friendship. That's love," she added. Doherty seems to have some hair growing back in the cute couple photo, after undergoing chemotherapy and it makes our hearts so full to see the survivor so happy. This isn’t the first photo Doherty posted as a part of the challenge, which was introduced to her by longtime friend, Sarah Michelle Gellar. Their mutual adoration and love are seriously giving us all the feels.